On September 18, 2014, Scotland will hold a referendum to decide whether it will secede from the United Kingdom and become an independent country. Scotland joined with England about 400 years ago and together with Wales and Northern Ireland form the United Kingdom. 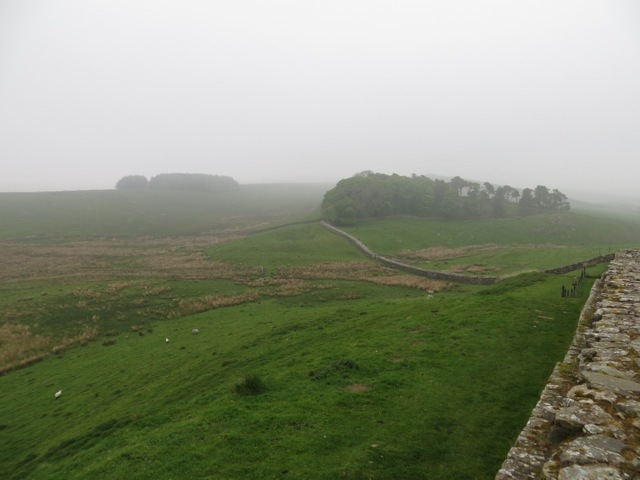 The traditional border between England and Scotland is the Hadrian’s Wall, built by the Romans 1,900 years ago as the outer limit of their empire. The Wall is 73 miles long and cuts the British isle from sea to sea. 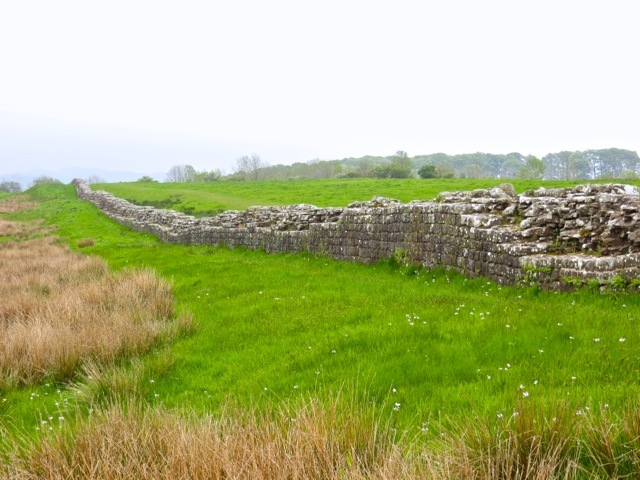 The Hadrian’s Wall was built to defend the Roman Empire against the Picts, meaning the “Painted People”. The Picts were ferocious warriors, known to paint their faces and sometimes went into battle stark naked. 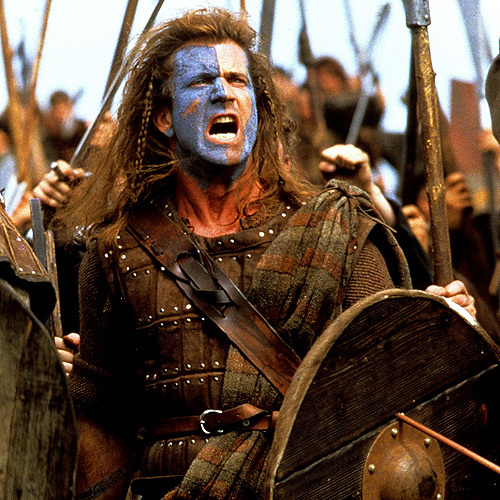 Mel Gibson painted his face as a later, medieval Scottish rebel leader in the movie Braveheart. 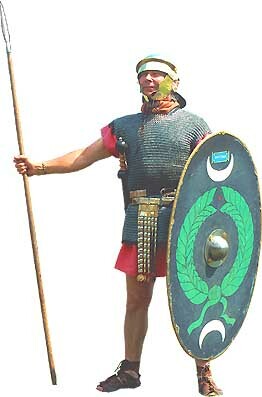 While the Roman regular legions built the Wall, they moved on to other theaters of operation. The garrison duty went to auxiliary troops recruited from the local people. 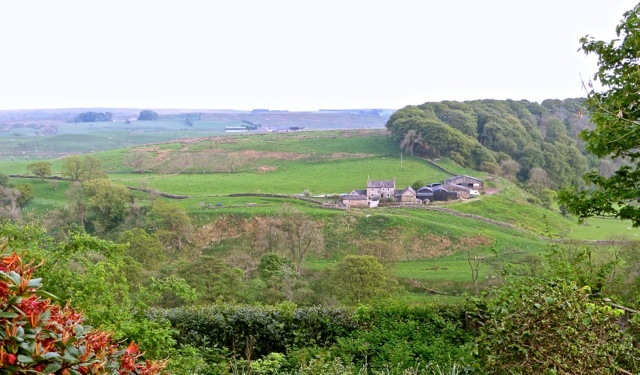 When Sally and I visited the Hadrian’s Wall, we stayed in a B&B with a view of the Wall in the distance. The Wall was situated above a steep slope. 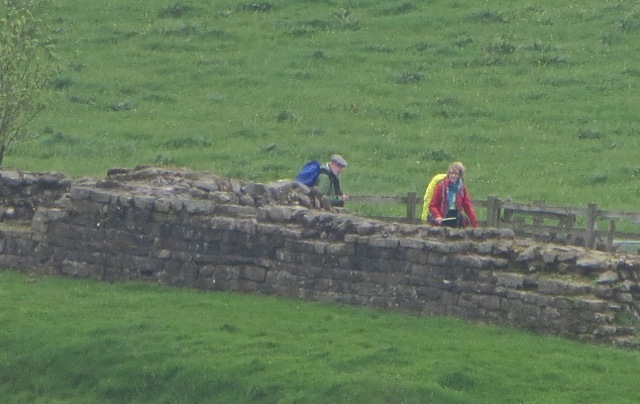 Two hikers walked along the Wall. 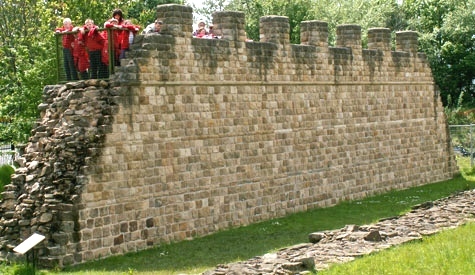 A section of the Wall is reconstructed to its original 16 feet height, edged with battlement. Soldiers would patrol on top of the Wall. 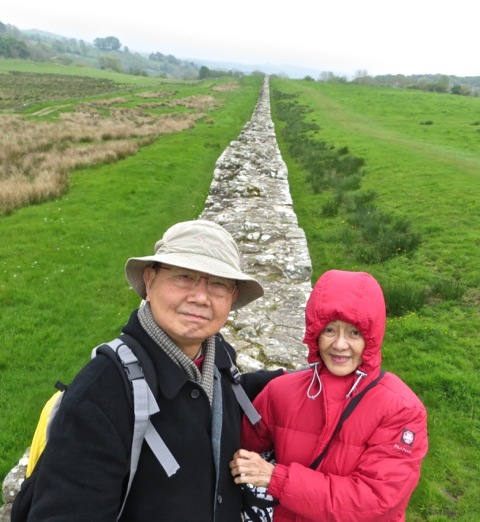 Sally and I stood on the low remnants of the Wall. The weather in May was still chilly and windy. Most of the remaining Wall is only three feet high. 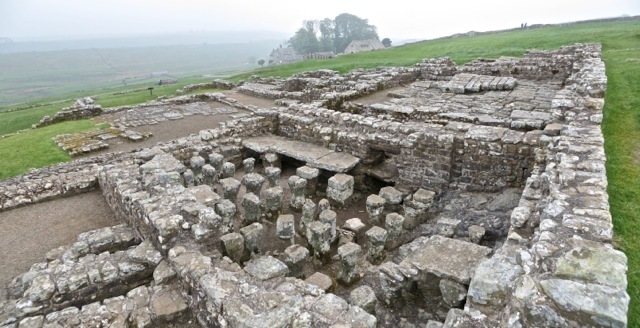 Through the centuries, it was dismantled by local people as a source of building materials. 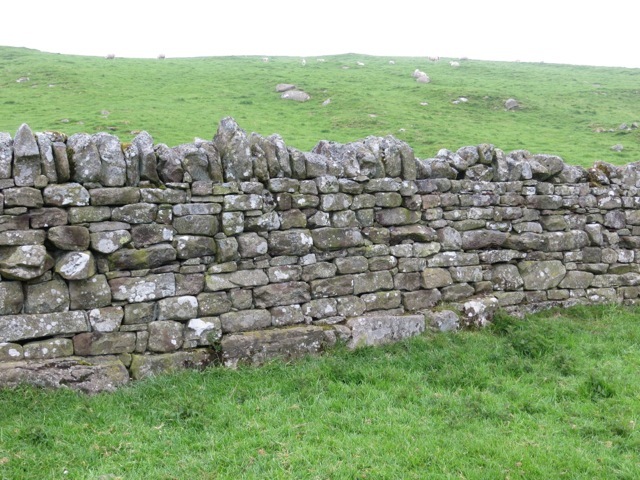 This new wall is built with dressed, rectangular stones “salvaged” from the Wall as well as irregularly shaped field stones. 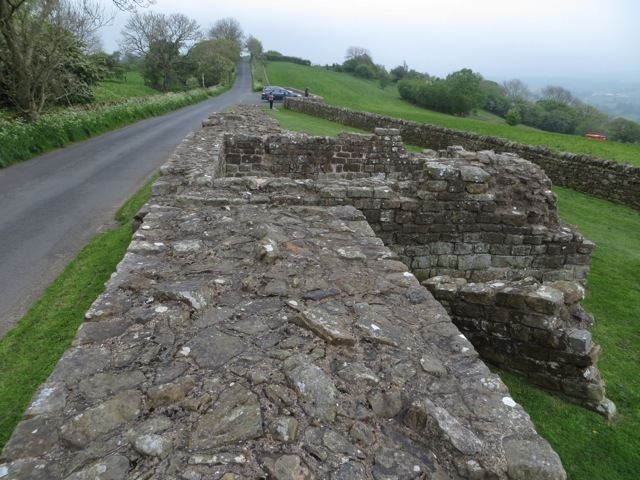 Every mile or so, the Romans built a small fortress to house the garrison, keep watch and as a protected gateway through the Wall. 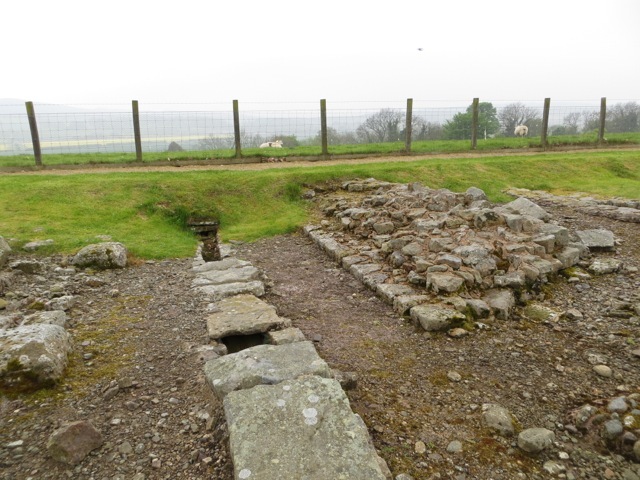 This is the stone remnants of one milecastle. Even a minor construction in a remote outpost warranted sturdy construction by the eternity-minded Romans. 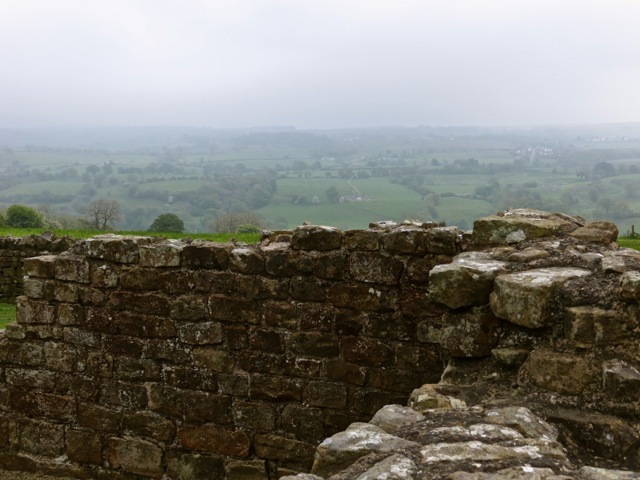 The garrison soldiers saw this scenery from the milecastle. A dozen forts were built adjacent to the Wall, each one housed 500 troops. 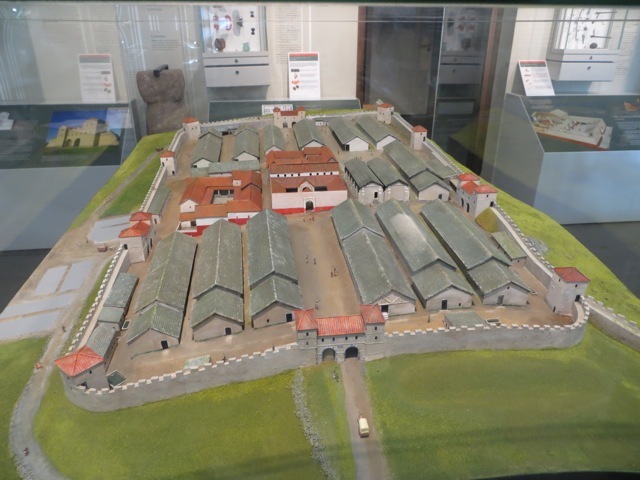 This model of a fort at Housesteads shows the commander’s house, provisions storage, administrative building, hospital and rows of barracks. 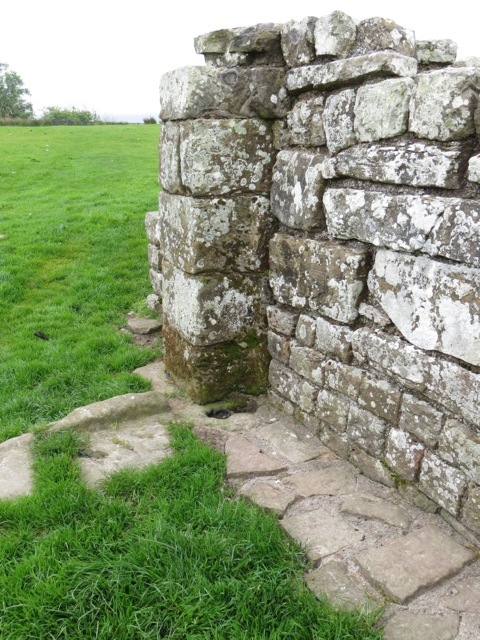 The post hole for a door hinge is visible at the remnant of a gate. 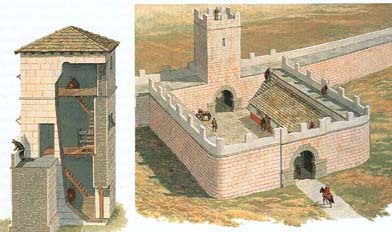 The provisions storage facilities was elaborate and well stocked to supply the garrison. 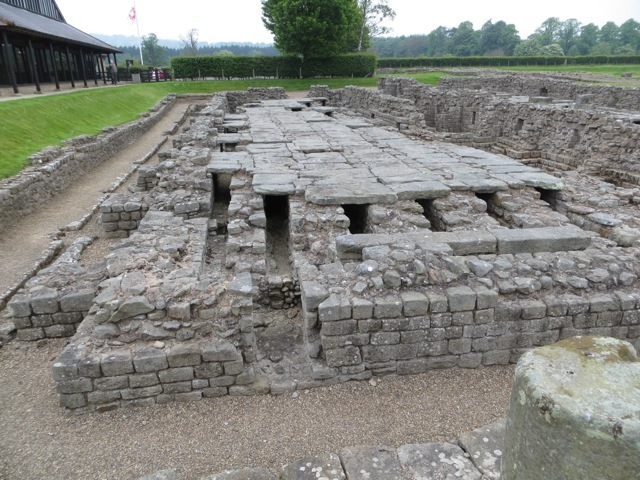 Barracks were neatly lined up. 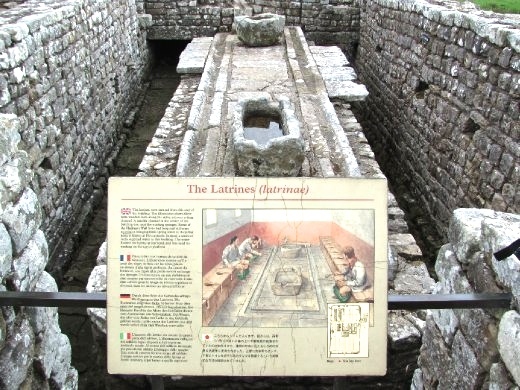 The communal latrine was situated in one corner of the fort and was constantly flushed by water. The Wall stretches from the fort into the foggy wilderness. With the large number of troops and camp followers at the Wall, a few towns sprang up to service them. 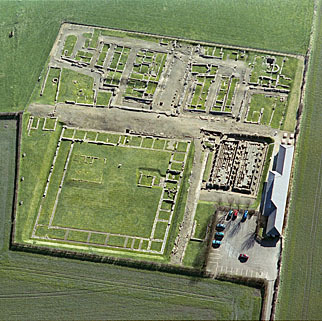 This aerial view of the excavated Roman town at Corbridge shows a well planned town. 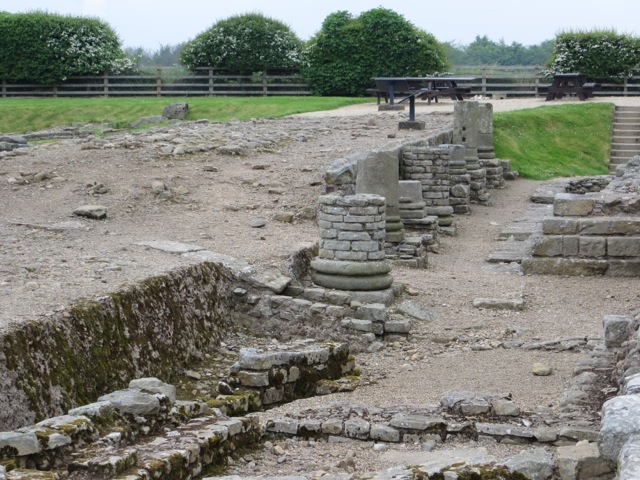 The road running in the middle of the excavated site divided the granaries and public building from the markets and residential areas. 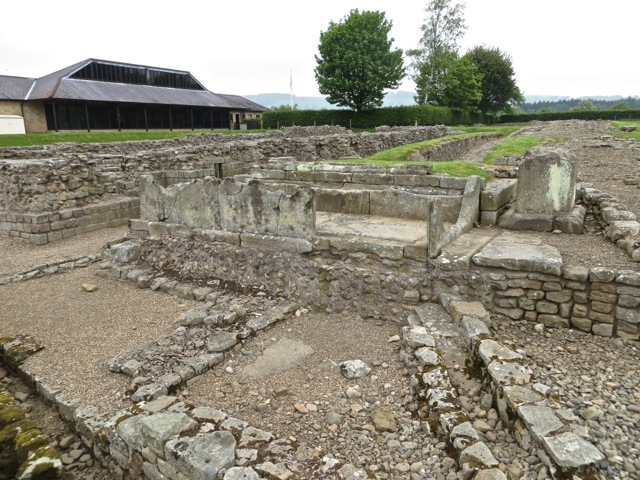 The granaries were carefully designed and constructed. A matrix of pillars supported stone slabs three feet above the ground. Air circulated under the floor kept the stored grains thoroughly dry. Otherwise, damp grains would get moldy and troops would go hungry, unable to defend the Wall. This is the relics of a public fountain pool. Through centuries of occupation, the road was repaved numerous times and raised higher and higher. The last level of the road was a few feet higher than its original design. We know of Roman columns as single, carved stone cylinders. But these columns were built up with stone blocks. 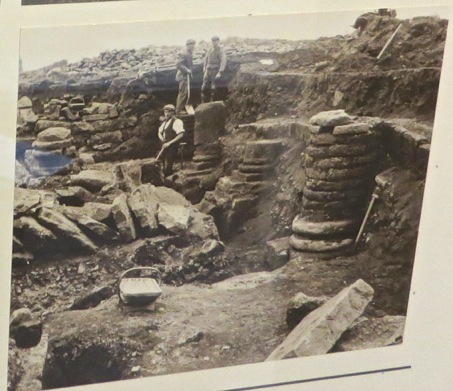 This old photo of the first excavation 100 years ago shows how deep the Roman town was buried by sediment. Posted by Robert Wu on Thursday, August 28, 2014, at 12:34 am. Filed under Uncategorized. Tagged 1. Follow any responses to this post with its comments RSS feed. You can post a comment or trackback from your blog.